Faced with the dauting challenges of Boko Haram insurgency and likely political wind of defection about to sweep across his state, Governor Kashim Shettima of Borno State Friday, held a closed-door meeting with Gen. Ibrahim Babangida (retd) at his hilltop mansion in Minna, Niger State. According to Leadership Weekend, the governor arrived at the residence of the former military president shortly after the Juma’at prayers with his retinue of aides. Shettima, according to the report, entered into a closed meeting with Babangida immediately he arrived at the residence and spent about an hour before departing at about 3.30 pm. 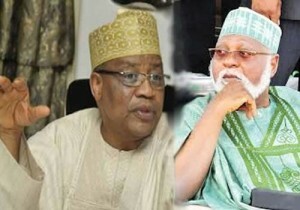 It was also gathered that former head of state, General Abdulsalami Abubakar, who is neighbors with IBB at the hilltop, later joined the duo for the meeting. The details or the reason for the visit of the embattled Borno governor was not immediately clear, but it is believed it is not unconnected with the current security challenges in his state.